Robin Red Breast Xmas Badges. Cute festive bird. Merry Christmas fun family holidays. We have a huge range of Christmas Badges available. With over 500 to choose from we have something for everyone. From father Christmas badges & Santa badges, to Christmas elf badges and reindeer badges, our Xmas Badge range is one of the biggest around. 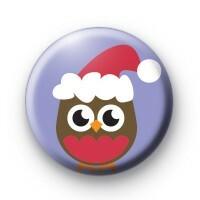 Our Christmas badges are perfect for teachers & schools & look great pinned to Christmas stockings or Christmas jumpers.